Some designs speak for themselves, especially the smaller ones. The larger designs although beautiful need careful thought, as they will not embroider everywhere and you need to consider whether to combine them with other designs. Take this the first design in Beatrice 4. Although this is a lovely design the unfinished ribbons are asking to have other designs attached. Look how different it looks with GFE-BEA-3-12 placed on the ends of the ribbons and GFE-BEA-2-10 added at the base! 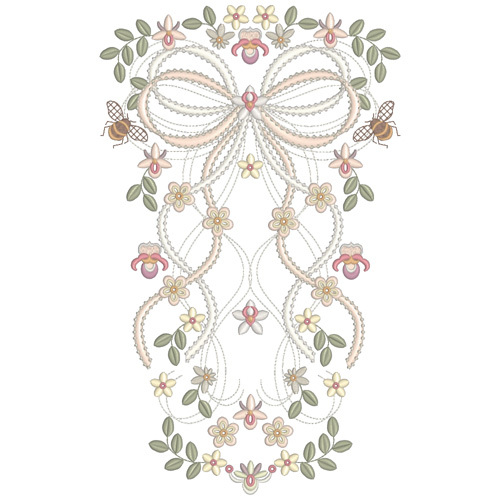 I can see this embroidered on a Christening gown or wedding dress provided the colours are toned down. 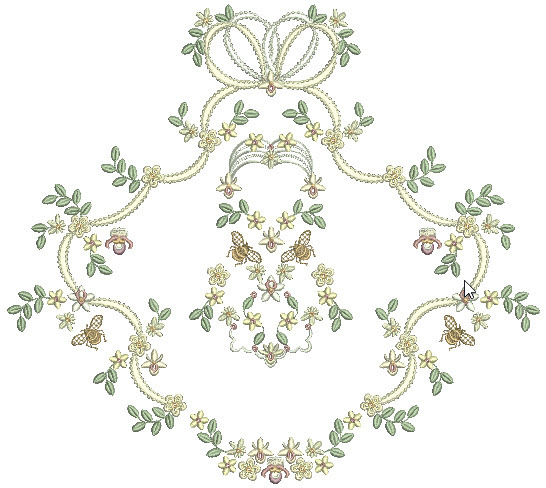 If you have embroidery software it can be very enjoyable copying and pasting designs, rotating and mirror imaging them to see how they combine. If you are unsuccessful, leave it and try again another day and I am sure you will surprise yourself. Do be sure to keep the original design files though. With my outline alignment stitches (OAS) placing a group of designs is a lot easier especially if you do not have any of the modern positioning on your machine. Let’s look at another design and see its potential. This design (GFE-BEA-4-4) is what I call an endless design as it will sit besides itself. I have digitised it carefully so that the flower on the right can be eliminated by not stitching out the last 3 colours. Notice the third design on the right without the flower. However you may not require this design to be stitched in a row, but prefer to create a curve of designs on a circular table cloth. This is a little more difficult to do but not impossible. I wondered if the curve would spoil the joining at the end of the ribbon but it worked perfectly. Surprisingly it also worked when I made the curve tighter! How different the design looks with this treatment. If you are worried about positioning designs accurately around a curve print out templates to help you and remember that my OAS will show you the outline of the design on just your stabiliser so you can position the fabric correctly with temporary adhesive before embroidering. Leaving a gap between the embroidery will also make it easier all round and slight discrepancies will not be so obvious. 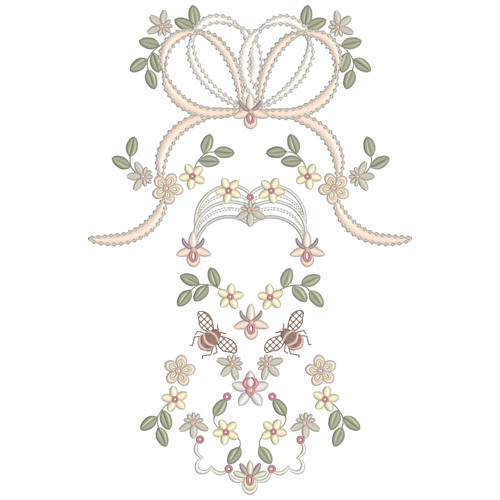 I find these combinations so exciting and think back to all those bridal gowns and veils that I made with such limited choices in embroidery. 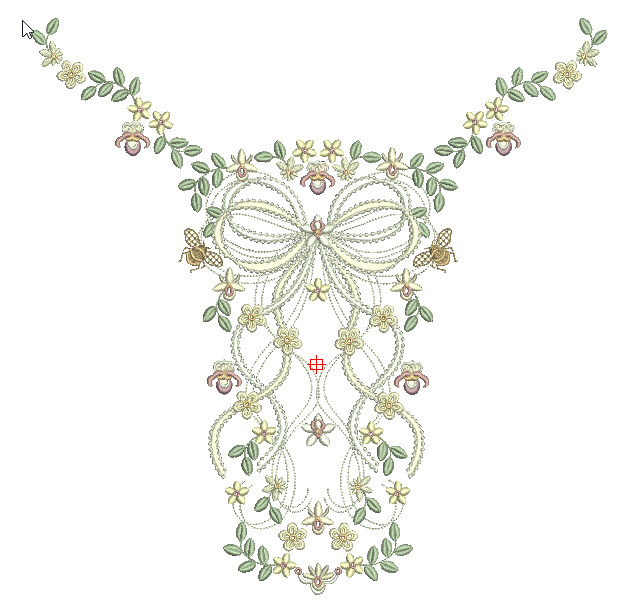 This next design (GFE-BEA-4-8) also hints at my bridal background as it is a wonderful bodice design, but it would also look great on the back of a posh jacket. Dare I say that it is best embroidered on its own? Well sometimes embroidery looks better when it sits naturally on a garment, following the contours of the neckline or hemline. Then it doesn’t look like an after thought. 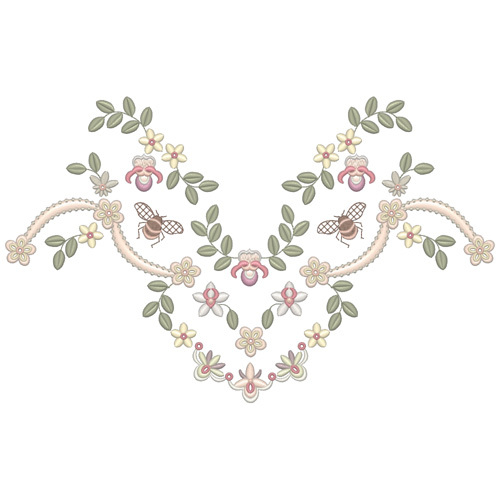 There are several small designs in the first set of Beatrice that can be place to follow the neckline so the yoke or bodice looks as though it was designed around the embroidery! I added GFE-BEA-1-9 and GFE-BEA-1-32 to the top of this design. There are some other exciting designs in Beatrice 4, including a panel with the perfect corner, a deep border design just waiting to be embroidered on to a child’s skirt and another deep panel with buttonholes. The designs complete the Beatrice collection for now, although I plan to add some quilt blocks. Named after one of my granddaughters the designs stitch out beautifully in silk thread, and I recommend Tire silk #50. Beatrice 4 for 12″ by 8″ hoops will be released on April 18th, 2016. This entry was posted in Discussing machine embroidery, New Designs and tagged combining embroidery designs, machine embroidery, Outline alignment stitches, Placement of designs. Bookmark the permalink.